Our company is bracketed with the leading Manufacturers and Suppliers of Air Curtains from India. Precisely engineered, our Air Curtain is effective in air-conditioned areas, preventing warm air from entering and cold air from wastefully flowing out. It is designed with unique environment separation system to keep out dust, mites, insects, contrasting temperatures (warm/cold) to maintain the quality of air indoors. Our Air Curtain is acclaimed for high quality, reliability and durability. We take up bulk orders of Air Curtains and fulfill the same with utmost ease. 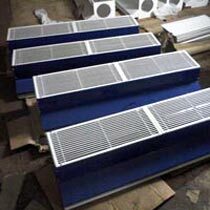 We offer customized Air Curtains at cost-effective prices.